Lordship Salvation: What About John 3:16? This website has received lots of comments and e-mails over the years asking, and sometimes even challenging us to debunk faulty interpretations of “proof texts” that seem to contradict the freeness of grace, or the availability of eternal life to anyone who will believe, or to backload the gospel with works. What about the fruits of the spirit? Isn’t that proof or is that more what changes in a person after belief for salvation? I would also strongly encourage you to study the Book of James for a better understanding of Salvation and the works that accompany it, and what about Jesus and the teaching of trees and fruits? And what about 2 Peter 3:9 and Acts 3:19 and Luke 13:3? Does this mean that we are not supposed to say” you got to repent(turn from your sin), and trust in Jesus Christ” when proclaiming the Gospel? JACK I was reading the comments before my first comment and i was reading where Cheryl on Aug.24, said that we don’t need to ask the Lord to save us or to ask him to forgive us???? what about Romans 10-9-10? We have to address the “what about” questions in order to defend the gospel, to help believers grow in understanding of scripture and to equip them in defending the gospel. We also answer the “what about” questions to plant seeds with religious unbelievers in the hope that they might understand the gospel and believe in Jesus as Savior. “What about” questions can also be used to proclaim the gospel. To that end, I would like to focus on John 3:16. John 3:16 is perhaps the best known Bible verse in all of professing Christendom, including among those who do not understand it, and therefore cannot and do not believe it. God is the Creator of all things. He eternally exists in three persons – the Father, the Son, and the Holy Spirit. These three are one God. Why did we need God to give us something? We needed God to give something for the world, because all of mankind has sinned against God. No man can get into heaven with any sin still charged to his account. Who did God give, and why? God is a God of perfect love and perfect justice. Our sins have to be paid for, and we cannot pay for them ourselves. So, God provided the answer to our need by giving us Christ Jesus simply because He loves us and would rather die than spend eternity without us. God did not give us Christ Jesus to help empower us to earn eternal life through good works. He gave us Jesus to save us. Who is His only begotten Son? His only begotten Son is Jesus – the eternal Son of God,; God our Savior; God in the flesh; the Lamb of God. Jesus is the eternal creator God, who took on human form to redeem us. He was born as a man through the virgin Mary. He lived a perfectly sinless life. He died for our sins and He was raised from the dead. John 3:17: For God sent not his Son into the world to condemn the world; but that the world through him might be saved. It is anyone who will believe in Jesus as Savior. Not whosoever God chooses to believe, as the Calvinists falsely teach, but whosoever will believe in Jesus as Savior. It means believing that we are in need of a Savior. People who don’t know Jesus as Savior are condemned to spend eternity separated from God, in a state of endless torment. It means to believing that He is God. It means to believe that He is the only way to receive eternal life. It means to believe that He paid the full price for our sins – all of them (past, present, and future) – leaving us nothing to pay. It means to believe that He was raised from the dead, proving that His payment for our sins was complete. Romans 4:24-25: But for us also, to whom it shall be imputed, if we believe on him that raised up Jesus our Lord from the dead; Who was delivered for our offences, and was raised again for our justification. It means to believe that Jesus is not only necessary to save us, but that He is enough. It means to trust in Christ alone as Savior. It means to understand that eternal life is a free gift, offered without cost or obligation to the recipient. We must understand that our good works, or good intentions will not help us get into heaven. Only Jesus could atone for our sins. We must rely on Christ’s righteousness, and not our own, for eternal life. Believe in Him for what? Eternal life. We must believe that Jesus offers us eternal life as a free gift. We do not have to believe that He is going to make us better or make us sin less. We do not have to believe that He is going to change our lives. We need only believe that He made the full payment for our own sins – that His payment was good on our behalf. This literally means the believer in Christ, even if he dies physically, will never experience the second death of being consigned to hell, but will have eternal life with God. Revelation 20:14:15: And death and hell were cast into the lake of fire. This is the second death. And whosoever was not found written in the book of life was cast into the lake of fire. It is eternal life that can never be lost or forfeited, no matter what we do – or don’t do as believers, and regardless of whether or not our faith persists. The life of God cannot be extinguished. Therefore, if we have the life of Christ, our eternal life cannot be extinguished. Eternal life for the believer starts the very moment he believes in Jesus as his Savior. We do not have to wait until we see how we did, or whether or not we have persevered in faith and/or holiness. Ephesians 2:4-7: But God, who is rich in mercy, for his great love wherewith he loved us, Even when we were dead in sins, hath quickened us together with Christ, (by grace ye are saved;) And hath raised us up together, and made us sit together in heavenly places in Christ Jesus: That in the ages to come he might shew the exceeding riches of his grace in his kindness toward us through Christ Jesus. So, there you have it: WHAT ABOUT JOHN 3:16? This entry was posted in Assurance, Calvinism, Christianity, Eternal Security. Bookmark the permalink. Joarge glad to meet you, we’ve been nourished by God’s Word here at expreacherman. I remember hearing an explanation from my pastor (as an adult) about the book of James, specifically chapter 2. I felt good for a little bit, but it just didn’t sit right with me, because he kind of made it about grading on the curve. As I began to connect more of the OT Scriptures with the New, and understanding how the just have always lived by faith. Then learning when Abraham was declared righteous (while he was still uncircumcised) and realizing that was far before Isaac was ever born, let alone being offered on the altar. And of course the obvious, we don’t receive eternal life for that. And then I had a solid Bible study teacher who thankfully showed the difference, and what ‘kind’ of justification was spoken of in James (not justified to eternal life), but a demonstration of faith towards others. A working faith… the light bulb went off and Scriptures were no longer contradicting other Scriptures. Thankful to the Lord and His Word. Glad I found this older topic for some in-depth reading. Interesting discussion from hollysgarcia and RAS in the comments about the inspired book of James. Thanks for sharing this on my site John, so much good stuff here. Just re-shared on FB. John, I reread this article and am saving it, it is really a very well done article with great Scriptures, thanks for the time you spent on it. fryingpan9, I forget to mark to be notified when someone asks me a question, so sorry, and I hope you see this. I use picmonkey but you could probably also use power point. That’s a great graphic, Holly. (Great content too.) I tried making this comment the other day from my phone but . . . It’s a long story. WordPress and I don’t get along very well . . . If it’s not too off topic, can you tell us (me) how you made it? Which website or whatever? John, the picture above I made to hopefully illustrate the obvious preaching of law in his gospel. It was just the brief beginning of one of his sermons — a works laden Pilgrim’s Progress type road to heaven. Even so, people are deaf, dumb and blind when following their Blind pharisaical leaders into the ditch. Holly, thanks for the link. Kate, literally when you think about it the common denominator of loadship thinking is contributing our efforts towards salvation which is the basis in foundation for all false religion. I made this picture of MacArthur based on some of his comments. Phil – MacArthur has the longest works based ever on his ‘Only Road to Heaven’ sermon. I literally outlined what he said, it was almost a joke, and why no one would challenge him in that 3500 per service attendance is just beyond me. I don’t feel good about Dominionism at all and they don’t feel good about me. Like you, I started seeing it all around a few years ago so I took an interest in learning of their motives. It seems to me that Dominionism (Ds)/Reconstructionism (Rs) is Lordship eschatology. I don’t mean all LSers are Ds or Rs but all Ds and Rs carry LS beyond the individual to the state. Ds are generally Pentecostal “positive confession” types and Rs are generally strict Calvinist theonomists. The Rs, at one time decidedly opposed to Pentecostalism, have in recent years actively joined hands with the Ds in pursuit of bringing every sphere of culture into subjection of Bible (primarily Mosaic laws). The goal is to bring in the Kingdom of God SO THAT Christ CAN return. Opponents (such as myself, who are not post-mil, preterist, replacement adherents) are seen by Ds and Rs as antinomians that stand in opposition to God Himself —denying His Lordship and against His Kingdom. kat, dominionism/Calviniam/LS go hand in hand. How do you feel about dominionism and LS? I remember listening to MacArthur years ago. He had always propped up by many as a great Bible teacher. When I heard him, what I heard was works salvation. I thought to myself, “that can’t be what he means!” I listened more, and the more that I heard him, my first conclusion was correct. He is teaching works salvation. This is exactly what Paul would call ANATHEMA! Thank you Holly. I definitely take that comment as a compliment. “The Gospel According to the Apostles”, MacArthur makes the following statement revealing his hostility towards us Free Grace Christians, “Frankly, some mongrel species of Dispensationalism ought to die, and I will be happy to join the cortege.” – page 205, bottom paragraph. I have listened to MacArthur, but frankly watching the video with what seems to be awfully dark eyes, I have thought, “but grandmother, what big teeth you have”. Just prefer to look at the words, and to read these words from MacArthur just validates this man’s evil as well on top of his false doctrine. RAS – you are quite witty, your comments are thought provoking and bring a chuckle in other segments. What the one guys said about James speaking of whether people were ‘truly saved’ made me shake my head. James must have been one confused man as he chastised those he identified as brethren, brothers and sisters who had the Spirit in them (almost 20 times) and then identified them as people who were doing horrible works, seemingly automatically. In chapter 4 he chastises them for their wars and fightings, lust and killing, adulterers and adultresses in friendship with the world. Doubleminded sinners who needed to cleanse their hands and purify their hearts, the same ones who had the Spirit dwelling in them. Why does James need to bother to chastise them if these good works are automatic? Bilateral Contract Salvation, most commonly known as “Lordship Salvation” is the false doctrine whereby God offers a lost sinner the promise of eternal life in exchange for a lost sinner’s promise of future works. It is thereby an exchange of promises, or a bilateral contract. Because the controverys of Bilateral Contract Salvation developed more slowly than the question of other works of man commonly required witihin religion for man’s eternal salvation, advocates of “Lordship” or Bilateral Contract Salvation are embedded within the framework of evangelicalism, and generally regarded as a different “flavor” of the evangelical faith. Ultimately, however, there is no theological distinction between corrupt systems of theology that require works, such as water baptism, to be performed prior to gaining salvation, and corrupt theological systems that require the promise of future works in exchange for salvation. Any gospel presentation that makes, as a requirement for gaining eternal salvation, repentance from one’s sins, committing one’s life to Christ, making Christ the “Lord” (master) of one’s life, becoming a disciple of Christ, and other equivalent statements that require a promise of future behavior (Romans 5:8; Titus 3:5), is heresy. Lordship “salvation” is Galatianism, and is part of the Roman Catholic, as well as “reformed” religions. “Bilateral contract salvation” and the “Perseverance of the Saints” are two separate but interrelated doctrines within a complex theological system of salvation by works, which relies, at its core, on redefining the word “grace” as some sort of mystical empowering substance. This theological system is set forth in Thomas Aquinas’ Summa Theologica, Part 1 of the Second Part, Questions 109-114, “Treatise of Grace,” a 12th century manifesto of Roman Catholic Theology. In Protestantism, it is known as “Reformed Theology” or “Calvinism”. What these “salvation slogans” (give your heart to Jesus” or “give your life to Jesus”, or “commit your life to Him”) have become is a contract where the person had so do his part along with Christ doing his part on the cross. Then the person would fall into sin and worry whether he really gave his heart to Jesus, or gave his life to Jesus and lived up to these commitments. I have heard and read people who use John 3:16 and other passage like Romans 6:23 and Ephesians 2:8,9, YET, almost in the same breath, they will say the proper response should be “give your heart to Jesus or give your life to Jesus” instead of the proper response that Christ has done everything to save you; believe it and your sins are taken away and you have eternal life. Unfortunately, I think we can attribute much of this confused preaching to the most well-known and revered preacher of the twentieth Century: Billy Graham and his barrage of TV Crusades. Graham makes it clear that simply believing that Christ died and rose for you is not enough to save you; that your faith in Christ must include a commitment of your heart and life to Christ in order to be real. I was moved to write this article after hearing excerpts from a funeral for a fallen local police officer on the local radio news. The slain officer’s brother talked about his slain brother’s faith in Christ and then quoted John 3:16 to those in attendance. I don’t know whether that was the message given at the funeral, or not. But, I do know that is how it was reported by the guy reading the news. The point is that no one receives eternal life by “giving his life to Christ.” We receive eternal life by believing in Jesus. It may seem like a semantic difference, but it’s not. RAS, the practical definition of “antinomian” for most of the LSers is anyone that they think sins more than they do, or commits sins that they don’t commit. The reason LSers throw the term “antinomian” around is they think it proves a person does not have eternal life. For any readers who do not understand this, let’s be clear: There are Christians who are antinomian in attitude. Antinomian believers in Christ have eternal life that can never be lost or forfeited. LSers who have always thought they must maintain some minimum standard of holiness to have eternal life do not have eternal life, no matter how good they think they are being. Daniel, think about Christ’s righteousness. Btw guts, grit, and determination are admirable qualities; rewardable qualities. I see them in Paul and John. I think they exemplify Biblical manhood. But Paul and John, both brilliant, were justified by grace through faith. Jesus never described me as a “Son of Thunder”. Too many people think they are or need be Paul and John. I read it this way—you see it takes guts, grit, and determination to be justified. You throw that “law was not given to justify” stuff at me I’ll call you an antinomian, a coward, you non-zealous fake believer. “Gutless gracer” is a term coined by Dan Phillips of Pyromaniacs: a strange blend of Dispensationalism and Reformed Theology—a MacArthurite. We can add him to the Wiki list. He’s a five pointer and I would say that the very hermeneutic that produces dispensationalism also deals howling, shrieking death to TULIP. But then again, he’s the genius not me. Or is it I.
I hate it when I end up having doubts about being saved. My mind wants me to think that in some way, I’m doing faith plus works which will bar me from heaven. Ugh. So irritating. RAS, once someone plays the “true believer” card (in terms of good works automatically becoming part of a “true believer’s” life), they are no longer teaching grace. I have heard so many sincere but lousy attempts to “harmonize” John 3 with James 2. What ends up happening is that people who wish to avoid the charge of “cheap grace” (I’ve even heard the term “gutless grace”) end up seeing James as speaking of a faulty kind of faith and when doing so they end up blurring (if not obliterating ) the distinction between imputation and infusion of righteousness. —The following is from a recent post on an ostensibly grace oriented (non-reformed) website. Q: In James 2:14-26 he questions whether someone can be saved without works… And as you have said in the past (correct me if I am wrong) that it is what we believe and not how we behave that saves us. Is that right? A: Notice that James 2:14 says, “What good is it, my brothers and sisters, if someone claims to have faith but has no deeds? Can such faith save them?” I believe the phrase “claims to have faith” casts doubt on the person’s sincerity. James was saying that for people who are truly saved, good works will become an automatic part of their lives. First of all, the Holy Spirit will prompt this, and second these works become our demonstration of gratitude for the free gift of salvation. If James 2:14-16 means self generated works must be combined with faith to attain or keep our salvation it would stand in direct conflict with several statements by Jesus, who clearly said eternal life comes from belief alone (John 3:16, John 6:28-29. John 6:37-40) and Paul who was even clearer in saying that works are not a part of the salvation equation (Romans 4:4-8, Ephes. 1:13-14, Ephes. 2:8-9, 2 Cor. 1:21-22). My response (not allowed to respond on the cite): They have to play the “true believer” card to get a mental grasp that James is not contradicting John and Paul. To do so will only lead to fruit inspection. They also have to make the future salvation that James is speaking of equal to the past justification spoken of by John and Paul. This is the influence of the Counter Reformation and the road back to Rome. Many are on it and don’t even know it. Thanks John for this timely and well written article. William, unfortunately, I think you are right. The more I read about John Calvin the more it reveals that the man was definitely a murderer, especially regarding the murder of Michael Servetus whom Calvin approved of his execution just because the man had an unorthodox theological view. In Calvin’s 1561 letter to the marquis de Poet who was the high chamberlain to the King of Navarre Calvin states, “Honour, glory, and riches shall be the reward of your pains: but above all, do not fail to rid the country of those zealous scoundrels who stir up the people to revolt against us. Such monsters should be exterminated, as I have exterminated Michael Servetus the Spaniard.” – quoted in Voltaire, “The works of Voltaire”, volume 4, page 89, 1901, also quoted in “Ecclesiastical Researches” Church History Research and Archives, page 348, 1984, and also quoted in “History of the Donatists”, – David Benedict, Galatin, Church History Research and Archives, 1985. Even 9 years later after the execution of Michael Servetus, Calvin still justified his murder of Servetus by stating, “And what crime was it of mine if our Council at my exhortation, indeed, but in conformity with the opinion of several churches, took vengeance on his execrable blasphemies?” – in “History of the Christian Church” author Philip Schaff, vol. 8, pages 690-691, 1910. It is interesting to note that Augustine, who was Calvin’s idol whom Calvin emulated taught the same thing. Augustine states, “Why therefore, should not the Church use FORCE in compelling her lost sons to return, if the lost sons compelled others to their destruction?” – in City of God, On the Correction of the Donatists, chapter 6, section 23. This utterly false teaching of Augustine was based upon his perversion of Luke 14:23. Augustine states, “It is indeed better(as no one could deny) that men should be led to worship God by teaching, than that they should be driven to it by fear of punishment or pain; but it does not follow that because the former course produces the better men, therefore those who do not yield to it should be neglected. For many have found advantage(as we have proved, and are daily proving by actual experiment), in being first compelled by fear or pain, so that they might afterwards be influenced by teaching.” – in City of God, On the Correction of the Donatists, Chapter 6, section 21. There are many non Calvinists who see Calvin as a guilty murderer, but even among some Calvinists themselves that they see Calvin as a guilty murderer. William Cunningham states, “There can be no doubt that Calvin beforehand, at the time, and after the event, explicitly approved and defended the putting him to death, and assumed the responsibility of the transaction.” in “The Reformers and the Theology of the Reformation”, pages 316-317, 1967. 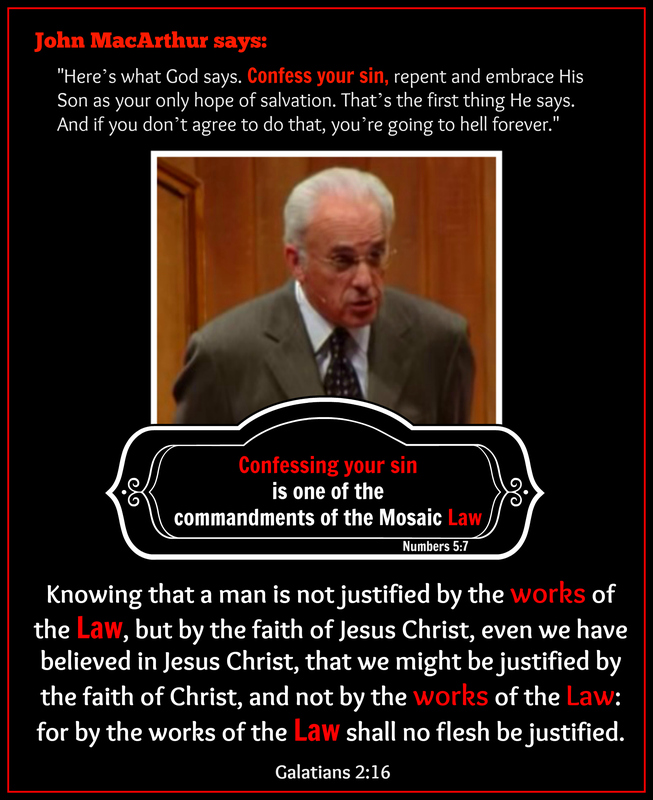 In modern times, we see John MacArthur, hyper Calvinist/Lordship Salvationist who holds the same mentality. In his book, “The Gospel According to the Apostles”, MacArthur makes the following statement revealing his hostility towards us Free Grace Christians, “Frankly, some mongrel species of Dispensationalism out to die, and I will be happy to join the cortege.” – page 205, bottom paragraph. A “cortege” is a funeral procession and it is obvious that MacArthur is referring to us Free Grace Christians. So, when is force/murder justified in the name of Christianity? Throughout history, there was the Inquisition propagated by the Roman Catholic church, then we have the tortures, banishments, imprisonments, burnings at the stake enforced by John Calvin when he ruled Geneva, and now we have MacArthur who appears to hold the same view. Lordship Salvationists don’t believe in the simple truth/simple reality of John 3:16, but they believe in John Calvin 3:16. Brian, good point of clarification regarding God the Father being specifically referenced in John 3:16. Lordship Salvationists have never been able to successfully deal with verses like John 3:16. Thanks for keeping them coming. You are right – grace is both free to us and priceless. God’s grace required the precious blood of Christ. There is no such thing as cheap grace. Great exposition, Amen. The “lordship salvationists” love charging those of us who believe that salvation is by God’s grace alone through faith in the crucified, buried, risen, ascended, and glorified Lord Jesus Christ with something they call “cheap grace”. It is so far from the truth! We treasure the riches of God’s grace through the redemption that is in Christ Jesus, through His blood. How dare they call anything cheap that required the blood of the Son of God! It was more costly than we can express. But God grants it to us freely, by His grace, through the redemption that is in Christ Jesus. Thank you for doing this work. It brings peace and understanding because it is Truth.